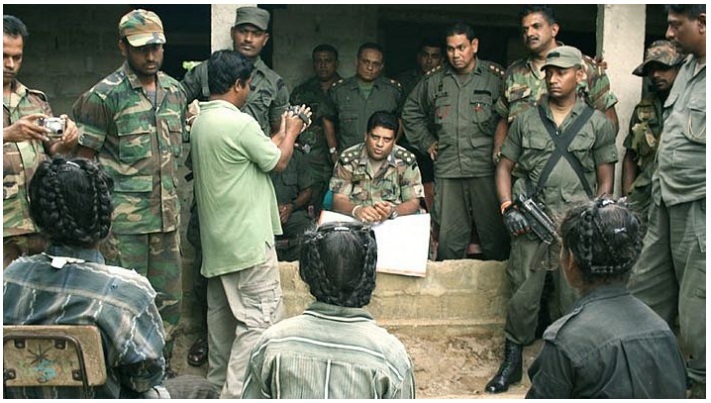 Shavendra Silva and heavily armed troops pictured interrogating female LTTE cadres who surrendered to the Sri Lankan army. There is “more than enough evidence” to suspend Sri Lanka’s new Chief of Army Staff, Major General Shavendra Silva, and charge him with war crimes and crimes against humanity, said the International Truth and Justice Project (ITJP) on Tuesday, as they released a 137-page dossier detailing his role as a military leader during an offensive that killed tens of thousands of Tamils. “There is a staggering amount of evidence in this dossier meticulously collected by my team over many years,” said ITJP’s Executive Director, Yasmin Sooka. The dossier compiles details from UN reports, witness testimony, official Sri Lankan military releases as well as photographs and other evidence from the 2009 massacres. “After the UN investigation completed its work in 2015, the ITJP continued to document and collect evidence regarding the war,” added Sooka. The dossier details several of the crimes Silva oversaw as commander of the 58 Division, including attacks on hospitals, the use of white phosphorus and cluster munitions, summary executions and sexual violence. “The international community cannot seriously talk about progress on rule of law and accountability so long as Shavendra Silva enjoys impunity,” said Sooka. See the full text of the dossier here.